Clothing/Accessories: Overall, Valentina's clothes are revealing to say the least. She tends to gravitate towards dark clothing, with almost all of her clothes being either black or a dark gray. The first piece of her attire are the sleeves that are detached from her shirt, with them coming together and tying at her neck. These sleeves are black in color with red trim at the end, the end being right above her elbows. She has a piece of cloth that covers her torso, starting from her breast, and works it's way around her torso before ending at her hips. This cloth leaves her stomach area exposed, though sometimes Valentina will put a piece of transparent fabric over it that appears to be a veil. 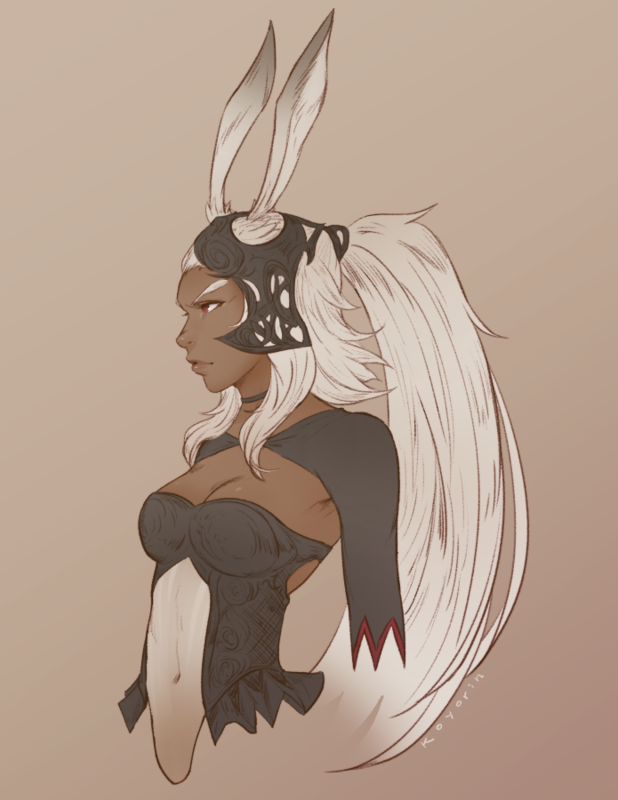 For the rest of her clothes, she wears tight black pants and no shoes due to her feet being shaped like a rabbit's. Personality: One can sum up Valentina's whole personality in a few traits. First and foremost, Valentina is prideful and arrogant. When given the chance, she's normally the first to believe in herself and the first to boast. She likes to talk about her accomplishments in a social setting to make those around her awestruck. Valentina is also light hearted, never really letting anything get to her as she doesn't take anything seriously. Those who've known her for a while will also attribute this trait to laziness as her lack of caring brings along a lack of effort if she doesn't fully agree with a task. Granted she won't complain, as that would go against her pride and image, but it's easy to infer this based off her actions. She is also very impulsive, often doing things to see what would happen or how those around her will react. She gets her entertainment from getting herself in difficult situations. Valentina has never been one to really set goals, and even if she does they're only something short term. The only thing that drives her in life is fame. Sure fortune is nice to have, but it doesn't matter after you die. Meanwhile, to her, fame can last forever as it's passed down from generation to generation. Combat: Valentina's fighting style is known as Bunny Boxing, though she puts her own personal twist on it. Bunny Boxing is fundamentally a very aggressive fighting style that utilizes all limbs of a Rabbit Mink, though with Valentina being somewhat insecure, she only uses her hands and her feet. To make up for the self-imposed limitations, she incorporates her knowledge of dance into her fighting, giving her more flexibility while also appearing elegant. The fighting style still keeps it's very offensive and aggressive feel, however. Description: Valentina takes a step with either foot and ducks low before throwing a straight jab with the opposite hand, aiming for her target's stomach area.